„Ganslernhang“ is a true classic. It could be described as one of slalom’s most iconic courses. 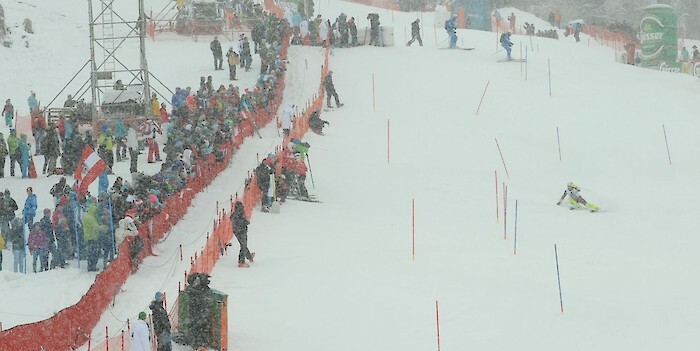 In the early days of the Hahnenkamm Races, the Slalom course was flagged out on the slopes of the Hahnenkamm and Ehrenbachhöhe. The Ganslernhang was used for the first time in 1937 and the race has been held on this traditional hill ever since. Racers describe it as dastardly, although at first it doesn’t actually look that steep. Each passage is different, the Ganslernhang comprises of every kind of terrain imaginable. No two turns are the same and the appropriate rhythm must be found right from the start. The first few gates are followed by a marked transition at the Goasweg, from where the course drops to the right over a lengthy section until it the slope abruptly falls away. The Steilhang surprises with its 70 percent gradient, sloping steeply down to the left, it does not allow for even the smallest of mistakes. The next big hurdle at Höhenweg and the strongly undulating terrain can only be mastered with the utmost concentration and a dynamic technique. This is followed – in the mid-section of the course – by a double groundswell and extremely shifting terrain in the fall line and two major transitions, before entering the second steepest section with a 48 percent incline. The most challenging section is the “Querfahrt” (traverse), which cannot be trained for. Thomas Sykora: “The spectators were so close to the race course in 1996, that I was momentarily blinded by a camera flash.“ The slope drops steeply to the left, where spectators seem close enough to touch, before leading into the “Kompression”, where the momentum from the traverse propels racers into a 90 degree oblique left turn (Stadl Curve). At this critical point it is important to temper speeds, whilst ensuring that no valuable time is lost. The course then heads down to the „Talei“, towards the finishing line, over a short crest and into the flat, gliding section, where it quickly becomes apparent whether skiers have retained the right tempo at the last turn or not. The skiers can feel the fans here in a multitude of ways. Cheers can be heard from all sides as the fans bang their drums, sing, shout words of encouragement and clap in rounds of applause – noise levels could be compared to those of a jet plane firing its engines. Here, in this flat section just ahead of the finishing line is where tragedy, victory, or defeat is determined and where every athletes knows if they have delivered the right performance or not. This is, after all, the finishing line.